Huawei Consumer Business Group (CBG) has unveiled the much-anticipated Huawei Mate 20 Series to users in the Middle East and Africa region during a launch event that took place at Burj Park in Dubai, UAE. “Huawei takes pride in being a pioneer in On-Device Artificial Intelligence, shaping the evolution of smartphones into intelligent tools that understand users in order to assist them. 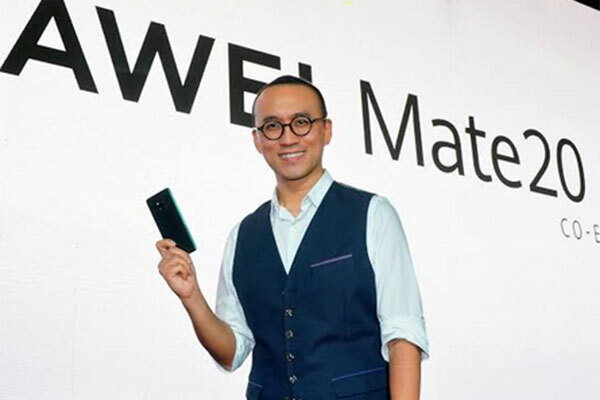 Through innovative features such as a revolutionary Matrix Camera System, a long-lasting battery and the groundbreaking Reverse Charging, the Huawei Mate 20 Series aims to empower users by responding to their daily needs and allowing them to fully immerse into today’s digital world,” said Gene Jiao, president of Huawei CBG, Middle East and Africa. Following a mesmerizing animation and a lightshow projection on the Burj Khalifa, an informative presentation about the brand’s performance in the region and how Huawei has grown to become the 2nd largest smartphone brand regionally and globally was given by Gene Jiao. Gene Jiao unboxed and unveiled the new Huawei Mate 20 series on stage. Designed with the industry’s most powerful and sophisticated process technology, the latest Huawei devices set a new bar by which all 2018 smartphones will be measured. The Huawei Mate 20 Pro is equipped with a 40MP main camera, a 20MP ultra wide-angle camera, and an 8MP telephoto camera. Together, the trio of lenses supports a wide range of focal lengths enabling it to mimic the results from professional cameras. Besides superb performance, the Huawei Mate 20 Series also features groundbreaking improvement on battery life. It houses a large, high-density 4200mAh battery, and supports 40W Huawei SuperCharge, which gives the device 70 percent charge in 30 minutes. The safety of the technology is certified by TÜV Rheinland. Huawei Mate 20 Pro and Porsche Design Huawei Mate 20 RS both support 3D Face Unlock. The solution quickly and securely authenticates users within 0.6s at a false acceptance rate of below 1/1,000,000. Using the 3D Depth Sensing Camera System located at the front, the two devices can accurately read the facial features of a subject and recognize even small details. Besides user authentication, this suite of sensors also enables the portrait beautification effects to be realized in a more natural and effective way. The Huawei mate 20 series also features an in-screen fingerprint sensor. The Huawei Watch GT is available in Black Stainless Steel and Stainless Steel body with variety of straps: Graphite Black Silicone Strap, Saddle Brown leather Silicone Strap, Glacier Gray Silicone Strap, Fluorescent Green Silicone Strap.